Jonnie King with Bo Huff on "The Hustler"
Hi ! Glad you stopped by Travis’ Site ! Don’t forget he’s got some neat Merch that you can pick-up…and some of it might just make a good gift for a “fellow gearhead” like yourself ! 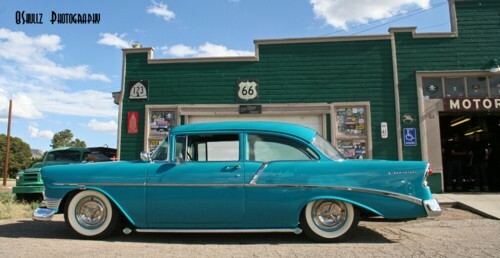 This week we’ll check-out BO HUFF’s Tastee-Freeze-Kool ’56 Chevy 210: “The Hustler” ! This is one sweet ride, and an homage to an old friend of Bo’s. In this very introspective Interview. Bo shares his thoughts on lowering your car, and takes a look at how he’s paid his dues through the year’s…and has become one of the most respected builder’s to ever light up a torch. BO HUFF IS A “LIFER”: a man who knew what he wanted to do, figured out how to do it right, and , now is recognized World Wide for his contributions to the R&C Industry. 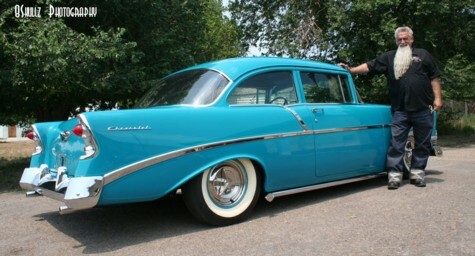 To hear his story about the beautiful ’56 Tri-Five that he’s put together, SIMPLY CLICK-ON-HERE and your on your way ! And, a big “Thank You” to all who take the time to visit here at Travis’ super-cool Site ! See you next week ! !